Lloyd’s Register (LR) has joined a project to build the world’s largest sailing cargo ship. 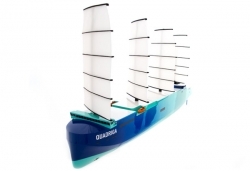 The Quadriga sustainable shipping project, an initiative from Hamburg-based Sailing Cargo, outlines a plan to build a 170m car carrier vessel capable of carrying 1,700-2,000 cars. The hybrid vessel will be equipped with a quartet of DynaRig masts, and will be powered by sail and diesel-electric propulsion. The design also includes an optional battery system for peak load. Initially capable of sailing at 10-12kts, the project aims to increase this speed to 14-16kts in the next few years thanks to the project members’ expertise. Low Carbon Pathways 2050 – a study by LR – revealed that the maritime industry must see low-carbon vessels entering the fleet by 2030 if emissions targets in line with the Paris Agreement are to be met. Wind-assisted propulsion technology represents a realistic option for integration of renewable power into the industry. 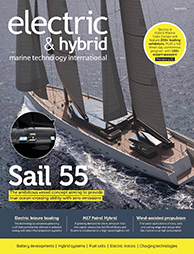 A widely held opinion across the maritime industry, however, is that engineering advances (and their associated efficiency gains) will not be sufficient to meet this target. LR’s belief is that vessels’ fuel sources will have to change – making the Quadriga project a showcase for a viable alternative solution. LR’s role in the project will help ensure compliance with technical, safety and environmental standards at the realisation of the project, and will see the company consulting during the design and specification stage, as well as supervising on-site new construction. LR will also be responsible for verification of the predicted performance parameters.